Rugby Borough maintained their unbeaten start to the season with this convincing victory. Borough nearly opened the scoring in the fourth minute when Joe Henderson blazed over from ten yards out, writes Liam Waleczek. Rugby soon took the lead though, as Gerard McGahey darted down the left wing before cutting the ball back for Nick Brandish to score. Borough then went on a scoring spree, bagging three within ten minutes. It was soon 5-0 as in the 36th minute, debutant keeper Logan Maketa’s route-one clearance found Adam Shaw, who unleashed an unstoppable strike. The visitors did grab one back just before the interval, as a shot from 15 yards out took a wicked double deflection. The second half saw Borough add three more before the hour mark, as first McGahey grabbed his second before Shaw completed his brace with a simple tap-in. Shortly after defender Kane Finney added a sumptuous effort from the edge of the area. Manager Darran Tank made two attack-minded substitutions, with the introductions of Lewis Corcoran and Harry Cook from the bench. Shaw completed his hat-trick in the 73rd minute and there was still time for Borough to reach double figures, as first the outstanding Ryan Byrne teed up namesake Conneely before substitute Corcoran side-footed home after exceptional work from Taplin. 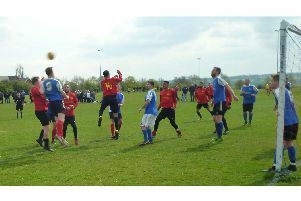 Borough saw out of the remainder of the game with ease and subsequently recorded their fourth consecutive league win. Man of the match: Gerard McGahey.